Castle In The Darkness is a retro-styled platformer developed by Matt Kap and published by Nicalis, Inc. Matt Kap is also a talented chiptune composer, who has worked on other popular titles like 1001 Spikes and The Binding Of Isaac: Rebirth (source). 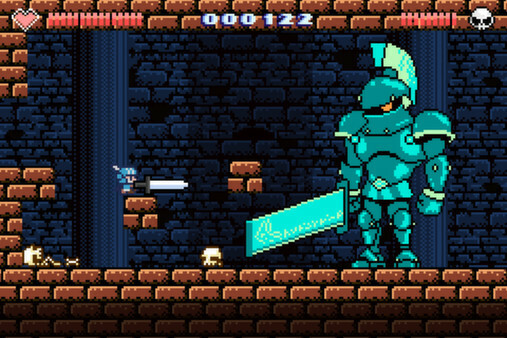 Castle In The Darkness is a metroidvania game with a simple (but awesome) 2D pixel art style. You progress through different areas of the game, defeating bosses and acquiring better weapons, armor, spells and abilities. The game has several optional areas and bosses and is pretty well stocked with secrets. The game also has multiple endings based on overall completeness and which items you’ve collected when you reach the final boss. There are many familiar faces you’ll fight throughout the game, like the goomba-looking panicked guys that can be jumped on to give yourself a little jump boost, or the blue hedgehogs that come at you with a spinning ground attack. The game is also thick with other references and in-jokes. 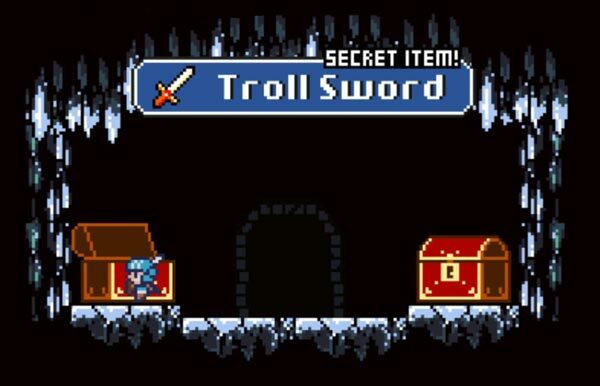 I was thrilled early on to find a hidden room off to the side of a spike pit containing some secret equipment called the Troll Sword along with Troll Armor. 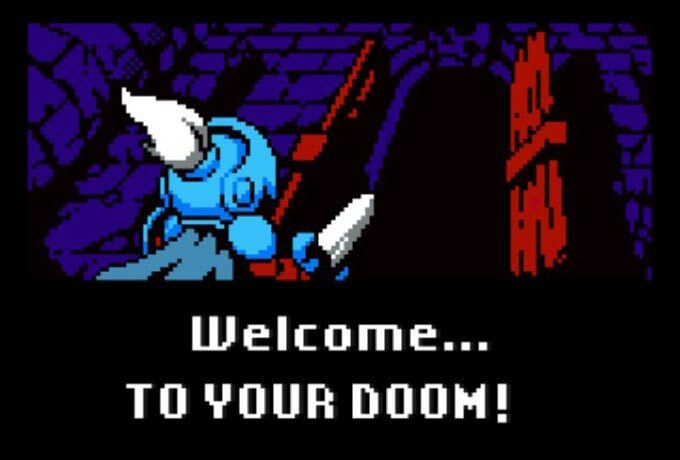 However, I couldn’t figure out how to escape the spike pit with my new items. I returned later thinking maybe with the double jump I could get out. After a couple of frustrating minutes trying everything I could think of, I gave up and sought the help of the internet. I’m an idiot. It’s called the “Troll” sword and the “Troll” armor. The joke was lost on me. The game has enough branching paths that you can easily find yourself missing entire sections of the game world. After reaching the final boss of the game with less than 50% completion, I tried back-tracking to find the areas I had skipped. Finally, after a ton of failed internet searches for game maps, I decided to start drawing my own to help narrow down where I hadn’t explored yet. Not since La-Mulana have I had to get out pencil and paper to complete a game. It’s a trend I wouldn’t mind seeing return. I’ve grown really lazy playing recent titles that hand-hold you to the point you can skip every piece of dialog and still know exactly where to go and how to complete an objective. There was an area in the game that I assumed I couldn’t progress through until I acquired an item that would allow me to swim. But, since I had already reached the final boss and couldn’t find the item in question, I tried a different approach. Near the end of the game I used what you could call a “damage boost” to clear a gap. This is where upon hitting an enemy, your character is given a tiny bit of upward velocity as they receive damage, giving you a bit of a nudge into the air. In the water area, there was an enemy on a ledge who was firing attacks into the air that slowly descended. I jumped, double jumped, then hit one of the attacks on my first try and, sure enough, was given just enough of a boost that I cleared the gap and managed to enter an entirely new area called the Underwater Temple. I felt pretty smart for figuring out the trick to getting into the area. However, after making it to a save point and using it, I immediately realized I couldn’t leave the area without being able to swim. I had glitched my way into an area and couldn’t glitch back out. The game only allows for a single save per playthrough, so when I saved the game, there was no way to load an earlier save point. I was stuck, needing to completely start the game over and feeling like I had wasted hours of gameplay. Luckily I found a community page with other people who made the same mistake as myself. The developer Matt Kap (almost immediately) promised he would update the game so that when you tried leaving the area, you could type the letters “K A P” and would get warped across the gap. I’m still not sure why you type K, A, and P… it must be another in-joke I don’t get. This is a lesson for any intrepid young game designer to carefully play test your game, and then to also pay attention to community forums and assist players with troublesome issues. My respect goes to Matt for quickly providing a solution to the issue as well as to the community for not filling the forum with an endless sea of useless and hateful “I wasted my time and money” style posts. Remember, it was mostly my own fault that I got stuck there. There really wasn’t a solid reason for me to believe that I was suppose to damage boost my way into that area. I just happen to get “lucky” and was able to do it on the first try. Honestly, if I had designed the game, I would have pointed that out to everyone and said I wasn’t going to waste my time fixing a problem they caused for themselves. But then I’m not a respected game developer and have been told in the past that I’m a hard person to get along with. Bunch of jerks. Get it now! Supplies are limited! The game is currently selling for around $6 on Steam. I’ve seen worse games sell for two or three times that much. There is no reason to wait until a big Steam sale to pick this game up. Buy it now and play it. Then go and buy the amazing soundtrack and then mail Matt Kap a blank check because this guy needs to keep making video games. He’s awesome at it. Castle In The Darkness was released February 5, 2015 for PC.